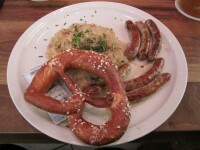 The start of Oktoberfest in München is a mere 11 days away. If you are thinking about going this year or anytime in the future, here are a few tips to consider as you prep for your trip to Bavaria. If you are looking for a dirndl or lederhosen to wear to the festivities I would recommend purchasing one before getting to München. Once in the city they are going to run you anywhere from $300-1000. Before going last year, I got my off eBay for about $50. It came from the non-Bavarian country of Turkey, but looked pretty authentic. P.S. Don’t waste your money on cheesy costumes…you will just look like a jerk. If you don’t have pockets take a bag or purse that you can sling across your chest. This will ensure that you cannot lose your stuff as easily. I unfortunately learned this the hard way last year. I thought I was being smart by just taking a money belt, but amidst all the beer and dancing I laid it down and you can figure out the rest. Get souvenirs another day. If you buy keepsakes at the Beerfest not only will the prices be much higher, but you are probably going to lose them. Trust me. As I said before, Oktoberfest is a black hole for people’s personal belongings. Several of us walked away with less than we arrived with. If you don’t make reservations for one of the tents beforehand you can still be admitted. Keep in mind that open seats are rare, so to hedge your bets and arrive before 3 p.m. on weekdays and before 10 a.m. on weekends. Also, food and beverages can only be paid for in cash once inside. 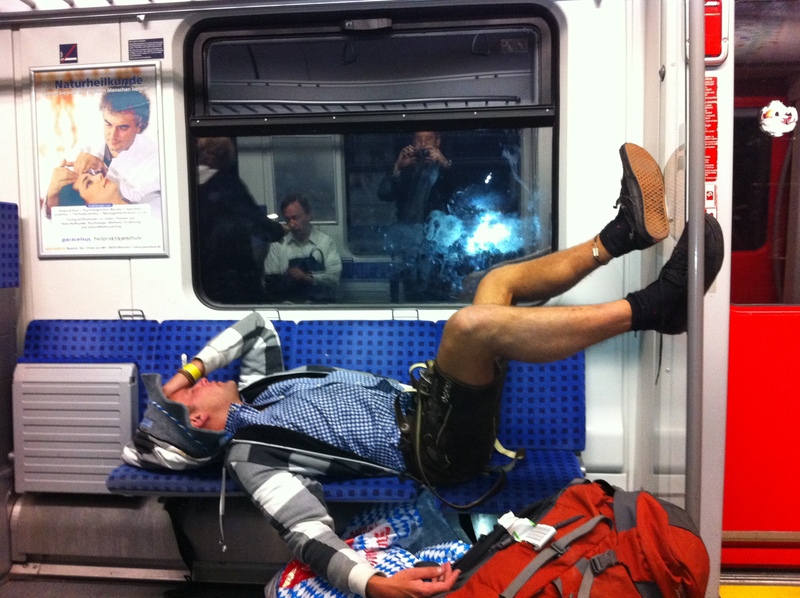 Lastly, keep it classy, or you end up like this guy we saw on the train. 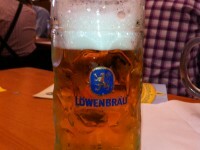 For more information on Oktoberfest and München, check out our other articles here. I thought that was the way you were supposed to end up like after Oktoberfest! We all took pictures with that guy on the train! I guess you know someone had a good time if they look like that!